Since I didn’t focus a lot of my attention on reselling in Q4 I made it a point to actually try this month. Reselling, if you aren’t familiar, is a method of buying goods with the sole intention of reselling those goods for profit. In the process of buying thousands of dollars in goods, you can earn a chunk of travel miles and earn reward cash from cash-back portals. That is reselling in a nutshell. I sold 40 items on eBay this month and sold a few things on Craigslist/Swappa. In the last few months I’ve focused on purchasing as much new and sealed product as possible. I am finding my overall “flip” time is reduced when I sell things that only need a visual inspection. If the plastic or security seal is on the box, I just need to photograph the outside and list the specs. My average time to photograph, list, and ship an item is around 20 minutes total. Roughly 25% of my reselling is with bulk quantities so I only have to shoot one photo and create a single listing, this is another huge time saver. To be honest, I don’t keep track of how much time I spend searching the web for product to purchase for resell. I don’t know that I could keep track since half the time I am looking for things to purchase personally and I end up finding a great deal on things to resell. Conservatively, I will allocate 20 minutes per item to find and purchase. I sold 40 items on eBay in December. For simplicity, we will say an item takes 20 minutes to find and purchase, and another 20 minutes to list and ship. That is 40 minutes per item, which is a very generous estimate of time, IMO. 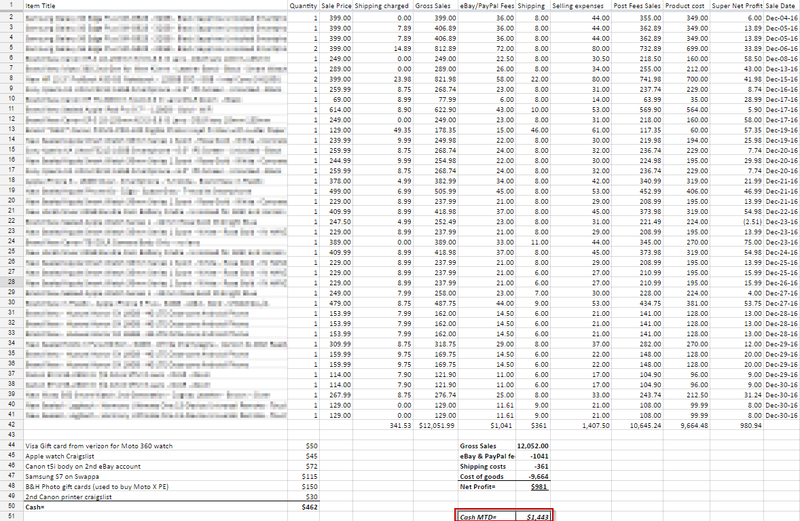 On eBay alone with these 40 items I made: $980.84 ($24.50 average profit per item). If you had more free time you could scale and earn a lot more at a $24.50 per item average. As you can see, I obfuscated the item titles in my spreadsheet, if you are curious to see them feel free to reach out on FaceBook and I will be happy to share. I sold some goods on the side which were not counted in the $980 total. I consider gift cards to be as good as cash since I can purchase goods to resell at a profit (which I did on row 34 above). In total earned $200 in gift cards from various product I purchased this month. I get this question a lot. What happens if you buy something and you lose money on it?? First, I would never buy goods that I didn’t think I couldn’t resell for a slight profit. On eBay you can search sold listings (click advanced search) which give you decent insight into what you can expect to get for your product. I also look at live listings on eBay to see what I will be competing against. My general rule is this: “If I can’t make a profit while pricing an item lower than the rest of the competition, I won’t buy it”. Also, make sure you are comparing apples to apples. If you search for sold Ipad Air 2’s, the resell value of a 32GB versus a 64GB is substantial, DO NOT overlook the minor details. Also, click into a few of the items and make sure they weren’t fictitious sales that were ultimately relisted, that can skew your perception of potential resale value. Assume that you will only be able to sell an item for less than your competitors and make an informed decision based on that. I also take into account what points I can earn from a purchase when calculating the ‘risk/reward’. Roughly 80% of the product I purchase to resell is from an online retailer with a return policy. Worst case I am not able to profitably sell a product, I am only out return shipping to that retailer. (and yes, they take the points back too) Which leads me to my next point: Only resell goods that you can ship easily and cost effectively. I am not reselling massive desktop computers or home surround-sound systems. They are too heavy and if I had to return an item, shipping would be killer. You can order free shipping supplies from USPS, my favorite is the Priority Mail PADDED Flat-Rate shipping envelope. It costs just $6.10 via eBay to ship anything that fits to the 50 states + Puerto Rico. If you want to add signature confirmation, which I suggest for items over $150~, it is only $2.35. About 75% of my buyers receive the item in two business days (including Saturday). 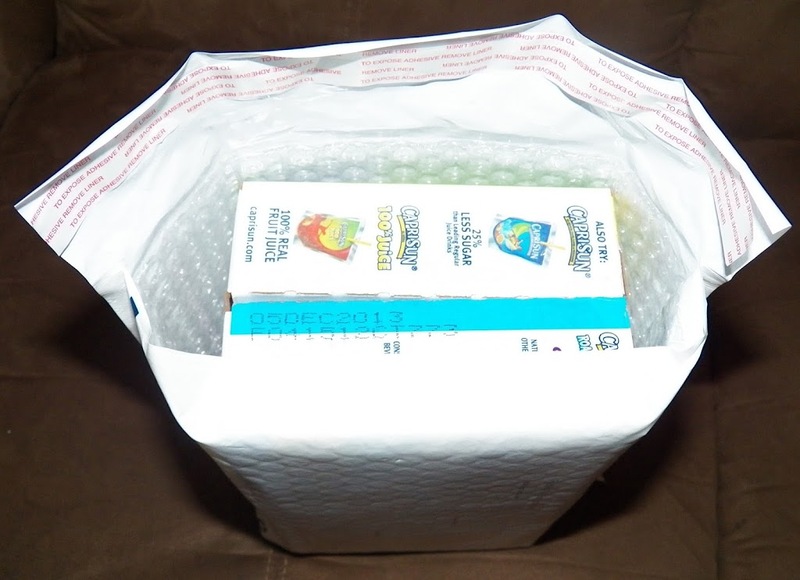 I found the image above where someone fit a CapriSun box in the padded mailer, they are pretty roomy. To boot, USPS will pickup items for free so you don’t have to leave the house. That is what I call “working from home”. Ah yes, I did indeed earn points this month. This is a travel blog after all, so don’t think I forgot the free travel aspect. When purchasing product to resell online, you can earn points from the credit card used as well as cash-back portals such as Ebates. If you really want to maximize your earnings, you can purchase gift cards with your Chase Ink card, then use those gift cards to purchase your goods. I talked about how to double-dip in this post. eBay has a program called eBay Bucks which are rewards you earn for making purchases on, you guessed it, eBay. You won’t earn points anymore if you are buying gift cards or bullion, they yanked that in October. The standard earn rate is NOW 1% but eBay often has promotions where you can earn up to 10%. In December I earned $353.48 in eBay bucks. 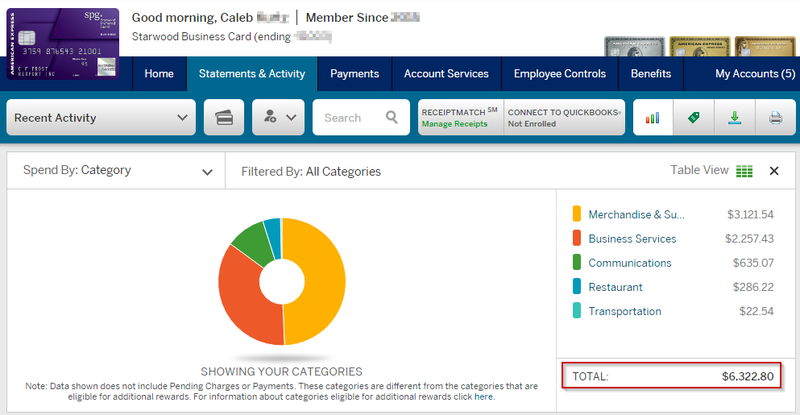 This is on top of credit card points, cash-back, and resell profit! I like to then use my eBay Bucks to purchase AirBNB gift cards which helps me to travel for free! In December I purchased over $15,000 worth of product to resell (some of the items are still for sale), that is why credit cards are essential. I doubt you’d want to use your debit card to pay for that much product. With credit cards I can earn points plus I don’t have to pay off the balance until 21-25 days after my statement closes. Despite the rumors, as long as you pay your statement balance off IN FULL no later than your due date, you pay ZERO interest on your charges. That is basically free short-term money to borrow plus you earn points in the process. Since most of my spending is on business credit cards, my statement balances are not reported to the credit bureaus. You can get a business credit card without owning a business. That helps keep my overall credit utilization down and my credit score up. My Chase Business Ink card earns 5x points at office supply stores, cell phone companies, internet companies, etc. So this month I purchased 9x Smart Watches on Verizon.com. I am in the process of selling the last few of the watches now, but I am on pace to earn about $30 in profit per watch. I will post a write-up in the coming weeks to discuss this major deal in more detail. I, as well as TPG, value Chase Ink points at 2.1 cents a piece. That means 8,999 Chase Ink points are worth roughly $190 towards travel. I posted the above screenshots since some people prefer to see it rather than me just typing it out. The only reason I take 2+ hours to write-up these recaps is to encourage and hopefully inform. If you have insight or tips, please share them with me as I love improving my efficiency as well. Starwood SPG points are extremely valuable, worth about 2.5 cents a piece. You can transfer the points to over 30 different airlines. I racked up $6,322 on my SPG credit card earning me 6,322 SPG points. 6,322 X .025 (2.5 cents per point) = $158 in value. The Four Points in Las Vegas is certainly nothing to write-home-about, but if you need a place to crash it will be better than a roach-coach. At $303 cash price or 3,000 points, you would be getting 10 cents per point in value. Let that sink in next time someone laughs at your SPG credit card for only earning 1 point per dollar. It is not always about the earning rate, but rather what redemption rate you can get.